Tater Tots For The Masses: Eat THIS Boys! 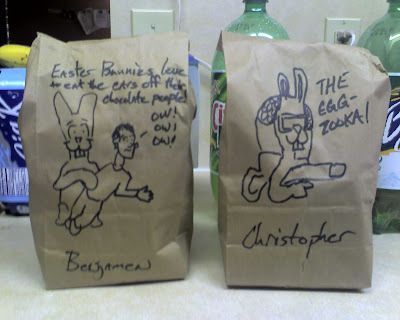 OK, so it's a slow day, but in honor of Easter (which is coming up), here are the lunch bags for today. I'm lovin' the lunch bags! Do the kids' friends appreciate how cool you are? Your comment over at furiousBlog was so priceless. I had just come back from fighting with the bank and you gave me a much needed, real good laugh. So now you have 6 readers! Thanks Dianne! 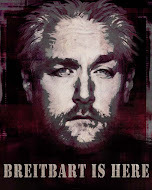 Welcome to the club, its small but exclusive (and by exclusive I mean no one really want s to join). Enjoy and thanks for the comment. h. Are the girls jealous? Or are they still in bed when the brothers leave for school? You're crackin me up man. The youngest girl hasn't really noticed. Lucie on the other hand demanded a line of princess lunch bags when she was going to preschool.